Oprah Winfrey recently interviewed Jim Jones Jr, adopted son of Jonestown’s Reverend Jim Jones. From his adoption as the first African-American child to be adopted by a white couple in Indiana, Jim Jones Jr. was given a loving multi-racial community, prestige in said community, the best of San Francisco’s private school education, followed by sudden massive loss as his beloved father poisoned everyone that Jim Jr. loved. The transcript of Oprah’s recent interview with Jim Jones Jr. can be read by clicking here. A small excerpt of Jim Jr.’s description of using alcohol to hide his pain, his ultimate recovery to save himself and his new family as he integrated the past with his present, can be viewed by clicking here. One learns to appreciate the goodness, count one’s blessings without denying one’s heritage. A few years ago, my grown daughter and I attended a film opening for “Jonestown, the Life and Death of the People’s Temple.” My grown daughter relished film clips of laughing children in Jonestown’s playground, remembering idyllic aspects of her early childhood in Maharishi’s community. This film depicted the allure, to explain how otherwise intelligent people could make such a fatal stumble. We know how they ended. The film was followed by a Q & A session with the filmmakers, Stanley Nelson & Marcia Smith, and Jim Jones Jr.
My blood boiled at the ignorant questions proposed by this supposedly educated man. I mentally retorted, “You’re a Berkeley psychologist, haven’t you read any thing about cults and brainwashing by the renowned late UC Berkeley Professor Margaret Singer? It’s so-called experts like you that inadvertently cause further injury to cult survivors! Didn’t we just watch the same film?” I could easily tick off the steps and methods of brainwashing / coercive persuasion clearly depicted in the film we had both just watched; I though that he should be able to identify the same. To their credit, both the filmmaker and Jim Jr. calmly addressed the arrogant psychologist. The filmmakers made this film precisely because they had realized that Jonestown survivors were not insane cult followers, much to their surprise. They wanted to show that good well-intentioned people with noble values could succumb to such myths as those presented by the Reverend Jim Jones. Jim and I laughed with shared comradery across the theater. The audience silenced. We were not laughing at needless death and loss. We laughed together at Jim’s statement. “We speak the same language” recognizing shared challenges of becoming whole and helping others by sharing once-hidden past stories. Jim and I inherently knew the drill; our past is too awkward for polite conversation. We ceased our banter, knowing we would meet afterwards. We agreed that in many ways our lives were opposite sides of the same coin – he lived the goodness and loved the man who most view as-if the devil incarnate. Jim Jr. was a true believer, blind to the ugliness of his father’s cult. When Jimmy was 19 years playing a basketball game in Georgetown, his father poisoned nearly everyone he loved. Jim Jr. has since stumbled then successfully created a new life, profession, maintained a long marriage, and now has grown children. My parents chose their spiritual leader, Maharishi Mahesh Yogi giggling guru to the Beatles, whom the world views as the spiritual leader who brought Eastern spirituality and meditation to the West. I saw dysfunction, and needless damage. Intimate family and group leaders reprimanded me when I spoke up with my blasphemous opinions and concerns. Eventually I left with my children to quietly begin life anew. Jim Jr. learned to bite his tongue when social and professional dinner conversations revolve around childhood stories. His out-of-the-box past could easily dominate any conversation. After decades of learning to fit in, stumbling, finally building a life based upon credibility and work ethic, Jim Jr now finds comfort and service by publicly sharing his insights. Once again, I acknowledge Jim Jones Jr’s integrity to continue to speak forth publicly of his personal trials and recovery, while continuing to live a humble private personal life full of love and laughter. Such stories help others to remember that anyone can fall for a cult – and also a reminder that recovery is possible. Time heals. All can rejoice, laugh and celebrate the continuation of life! 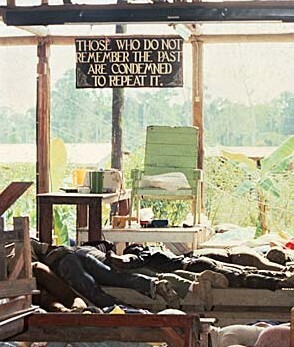 Chair of the Reverend Jim Jones, surrounded by his followers’ remains. This entry was posted in Cult and Cult Recovery on July 21, 2010 by ComingToLifeStories. This brought trickles down my cheeks. Tears born of gratitude and tears of honor. I notice they are not tears of grief or sadness, though stories of such horrific trauma are filled with sadness. And this piece inspires me Gina. Inspires me to continue to voice my truth and my story….if for no one else, for myself. To honor those decades of life. In them I lived and I died; I manipulated and was manipulated; I grieved and I rejoiced; I *found* myself and lost myself. And so much more. I and I and I and I…the multifaceted I.
I’m learning that folks who have never experienced an indoctrination that flows deeper than blood, and then left that system/relationship discovering (painfully) the deception at the root, have a difficult time grasping the magnitude of the effect of such. I was in two recent verbal conversations where I was left feeling….more than odd. I find it is much easier for my to write my experience than to speak it. Perhaps that may change, and perhaps not. Fifteen or so years ago I was listening to a cd of Walter Cronkite. One of the incidents he relayed was about soldiers from combat returning home. This is after Cronkite had been at the war zone in a military helicopter getting a taste of the unreal, yet so very real. Cronkite asked a soldier(s) how they relay what happened to them in combat and all combat encompasses – villages, innocent people dying, panic, killing, witnessing violence, pure survival instincts, and the rest [my words, not Walters 😉 ]. The answer was that people’s eyes simply glaze over; they simply can’t relate. Of course that is understandable. And perhaps the glazing too is a survival technique for the listener; the brain simply cannot process that depth of pain in a sitting (or even 20 sittings). I’ll always remember that story that Cronkite relayed.I resonated deeply with the answer form the soldier(s). I have never been in combat and do not want to even pretend that I know what that is like. But I have experienced trauma and deep, deep, deep emotional pain and sever chronic immune dysfunction. Not to mention an indescribable suppression of self (thus many of my physical illnesses were born). At that time and on that level I too had experienced others’ eyes glaze over when/if I would attempt to express or share regarding the physical illnesses. Of course, with all the suppression, I also glazed over. I think similar happens with others and me now, if I try to relay parts of my story. I realized after trying to answer the lady’s question, that I felt I had talked in circles. That one layer led to another. I realized there is no concise, compact answer that can relay all the layers. But still, I’m working on a response for those type situations, since two have come up in the last few weeks. Instead I’ll say “thank you!” for the platform. Breathtaking. Thank you for giving deep and thoughtful insight into a world and a way of thinking. This is so true.And its so extra frustrating when you go to the health system for help.And yet you end up feeling you first need to try and teach the Psychiatrist and Psychologists .In the end i just gave up. It only seemed to make me feel worse visiting them. Carol the eyes glazing over thing is what ive found too.People i try to explain things to, often seem to find it easier to try making simple excuses that they suppose will help me in some way.